These expansive patio umbrellas are constructed with high-quality materials to insure outdoor durability from the elements. The natural color is a great fit for just-about any existing color scheme. Easy to clean, this outdoor patio umbrella (also known as a market umbrella) will turn any afternoon into an easy, breezy affair! A great way to block dangerous UV rays from the sun and create a cool spot to enjoy your backyard. 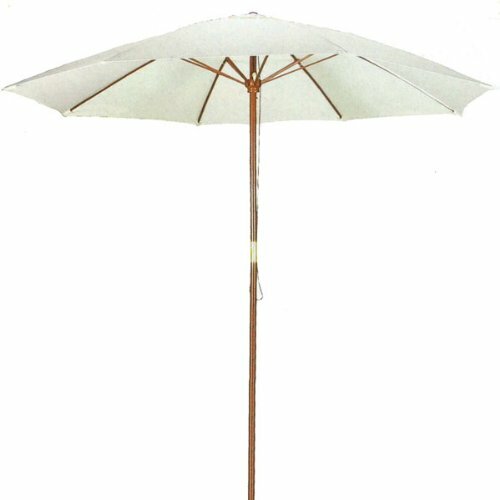 Use: Outdoor use only for your yard or patio; Material: Wood with polyester canopy; Includes: 2-piece wood pole, polyester canopy, 8 ribs; Other: Base sold separately. If you have any questions about this product by PSW - Patio Umbrellas and Bases, contact us by completing and submitting the form below. If you are looking for a specif part number, please include it with your message.